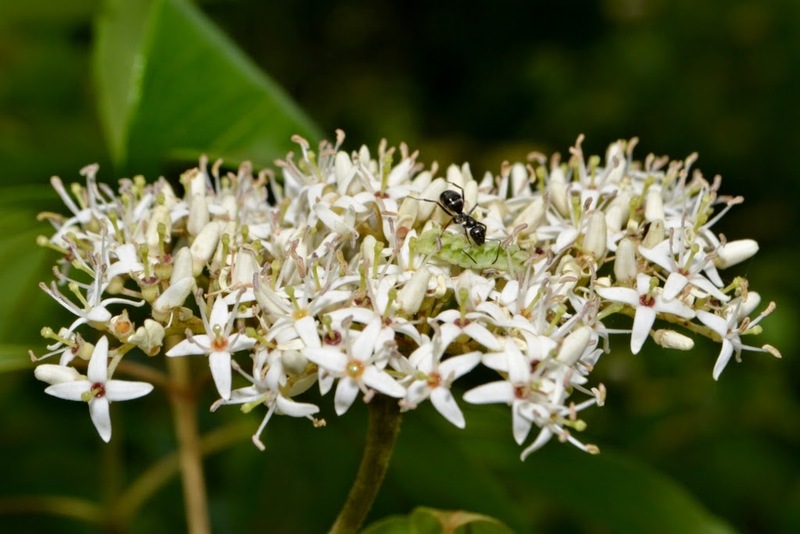 Azure Butterfly caterpillars and their ants are plentiful right now on our Swamp Dogwood flower-clusters. I have thoroughly enjoyed watching the caterpillar/ant interactions, especially watching the ants drumming on the caterpillars with their antennae (for food). In this post I'd like to share some photos and videos of these myrmecophilous Lycaenid caterpillars and their interaction with ants. In the photo above, it looks like the caterpillar is victim to some marauding ants, but actually, the ants and the Azure Butterfly caterpillar are friends. 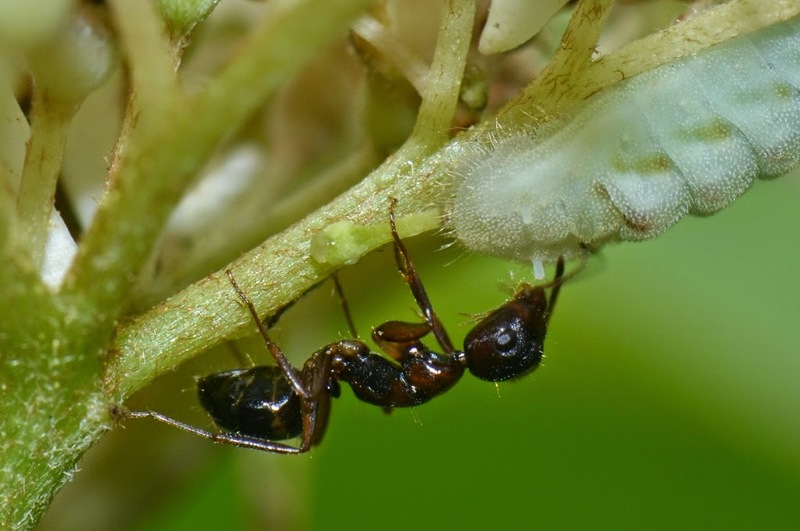 The ants protect the caterpillar and in return for their protective services, caterpillar provides the ants with honeydew. This mutually beneficial relationship between the ants and the caterpillars is fun to watch in action. Watch this video of an Azure Butterfly caterpillar and its friend, the ant. A couple of weeks ago I saw Azure butterflies laying eggs on the flowerbuds of our Swamp Dogwood. Here is a photo of one of the slug-like, greenish caterpillars that I now find on the Swamp Dogwood flowerheads. Note the caterpillar's little black head... it is rarely seen, as it seems to be retractible. I suspect these are the Azure Butterfly caterpillars (Celestrina sp) but I suppose there could be various other species of Lycaenid caterpillars on our bushes since the caterpillars I found varied greatly in color and were in various stages of growth. Notice in the photos how some of the Lycaenid caterpillars range from greenish to white to some with rose-colored markings. 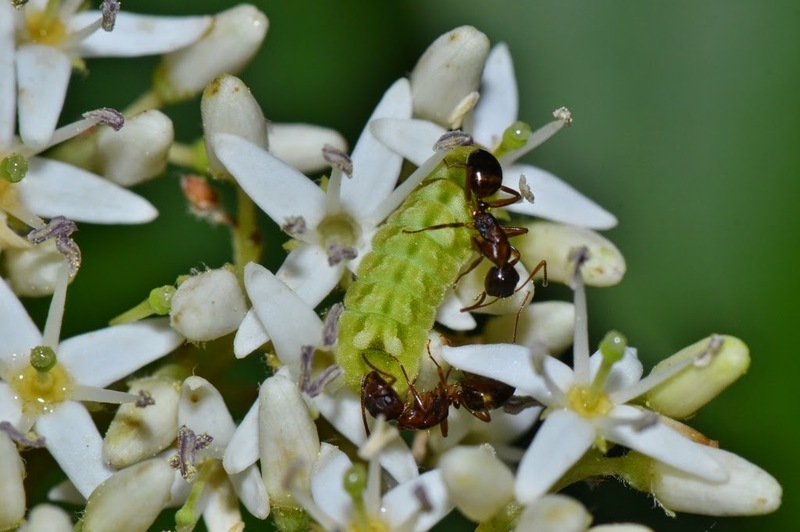 One thing the caterpillars have in common, whether they are all the same species or not, is their relationship with ants. Many of these myrmecophilous caterpillars are attended by ants. 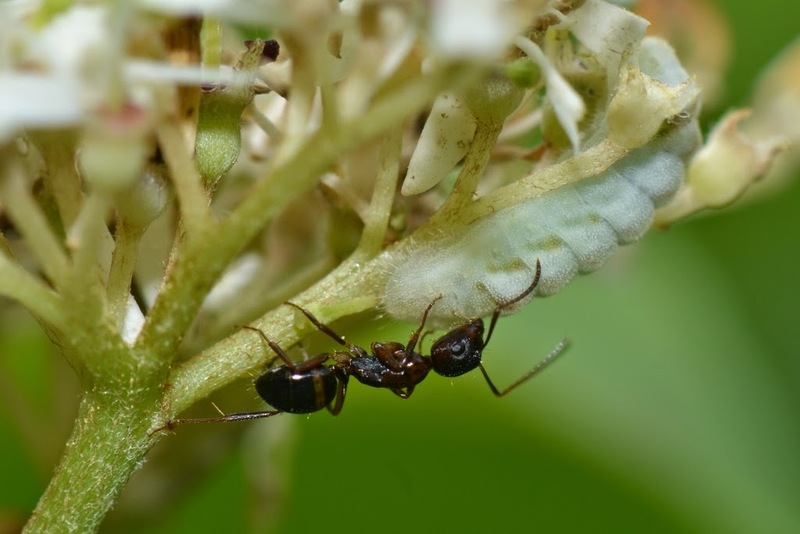 The ants are constantly scurrying around the caterpillar and climbing over them as they search for enemies. 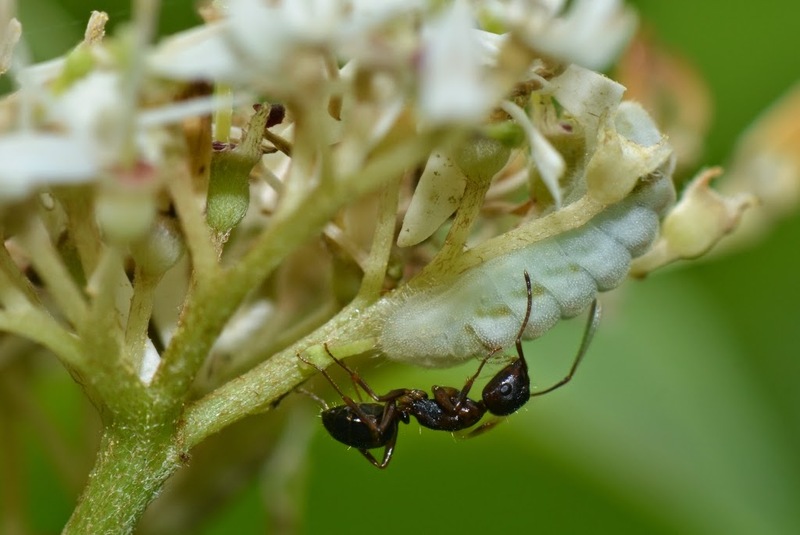 The ants frequently drum their antennae on the caterpillar and receive some honeydew in return for their guard services. This next photo shows an ant feeding from the honeydew gland on the lycaenid caterpillar. 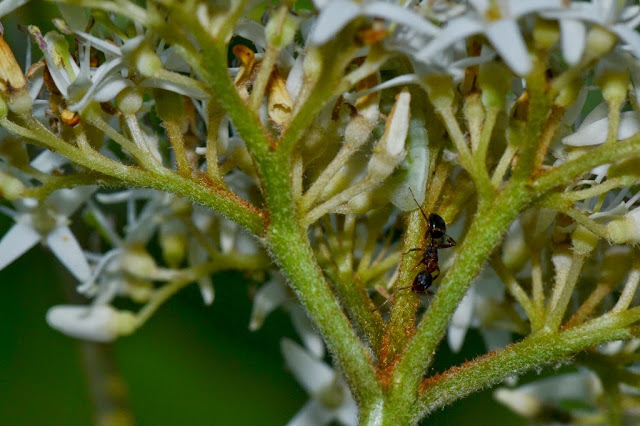 Notice that, in the photo above, the ant's antennae are blurry.... that's because the ant was drumming them on the caterpillar as if playing a drum. 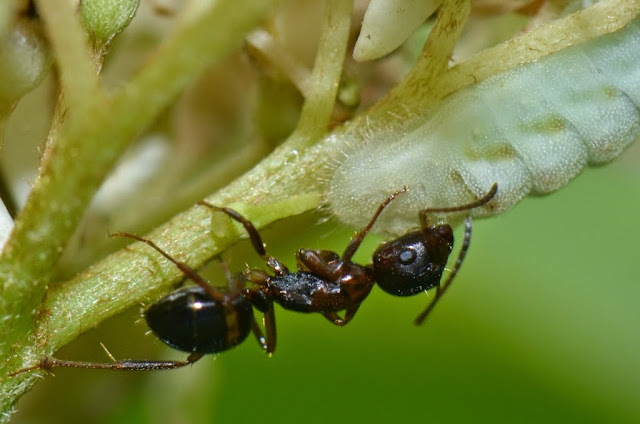 Watch this video of that same ant drumming its antennae and feeding on honeydew from the caterpillar. If you look closely at this next photo, you can see a glistening honeydew droplet just below the ant's mandibles. 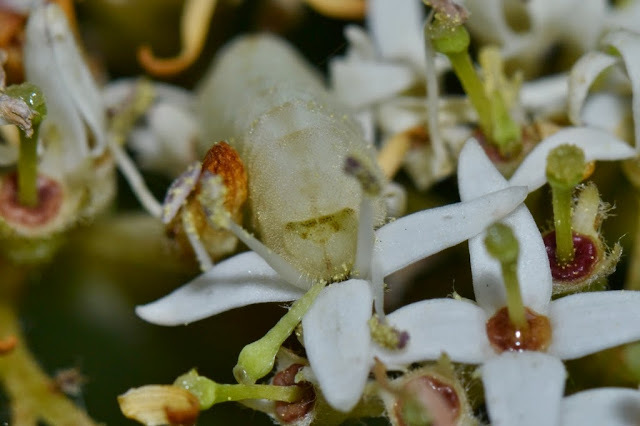 Next is a photo of a Lycaenid caterpillar... showing it in a typical position in the flowerhead of a Swamp Dogwood. The caterpillar's ant is scouting for trouble while keeping in constant contact with its friend, the caterpillar. I took this next video to show how the ants are very protective of their honeydew food-source. Watch as throughout the video the caterpillar feeds on a flower while its ant scurries around searching for enemies. Towards the end of the video, I poke a stick at the caterpillar and the ant aggressively attacks it in defense of its caterpillar. Once, I disturbed a caterpillar while removing an obstruction near it. When the ant came to tend the caterpillar it went crazy when it sensed some chemical signals from the caterpillars eversible tubercles. These twin glands are everted in the photo below and the ant is about to go crazy. These eversible tubercles must function as some kind of warning system/chemical signaling device to communicate that the caterpillar feels threatened. Those chemical signals work well to elicit very aggressive behavior in the ant. Here is a macro video showing the ant as it senses the chemical signals of the everted tubercles. Watch how the ant reacts to the two separate times the tubercles are everted. What an amazing warning system, eh? The Azure butterfly caterpillars (and their relatives) sure enjoy feeding on flowers. This particular Lycaenid caterpillar is mostly white. 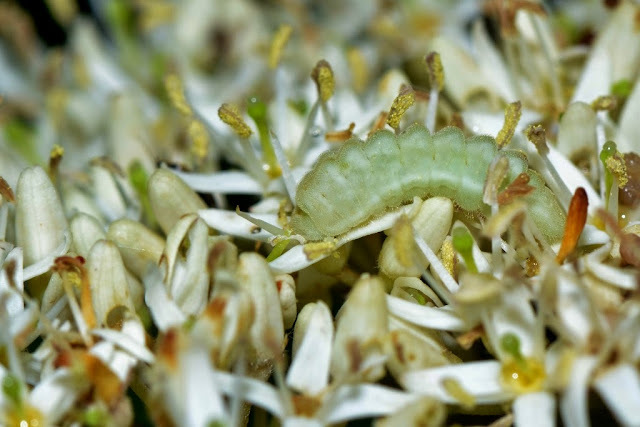 Green or white, the caterpillars blend in very well with the flowerheads where they feed. 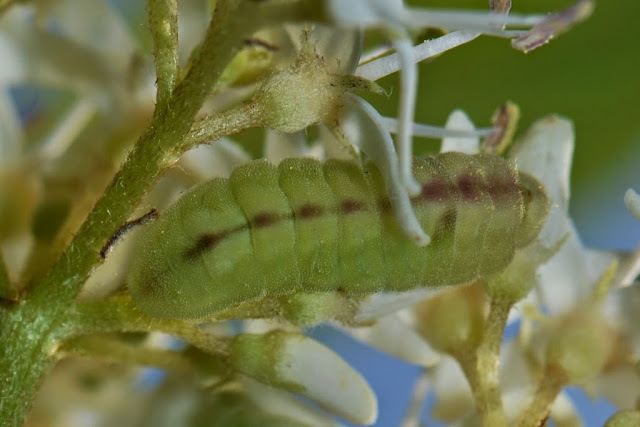 The next photo shows one of the larger Lycaenid caterpillars that were on our Swamp Dogwood. This one has a slightly rose-colored (?) band down its light green body. Well, there you have it! A Nature Post on the little drama happening in the Swamp Dogwood flowers in our backyard. I hope that you too have had the pleasure of watching ants protecting these flower-eating, specialized, greenish caterpillars of the Azure butterflies. See my previous post for a photo of the Azure butterflies laying eggs on the Dogwood flowerbuds. Amazing Dana ! The videos are terrific ! I hope to include more nature videos as time goes on. Amazing - that this takes place AND that you were able to capture it. The drama out there never ceases. The ant's drumming made me think of the repetitive tapping nursing mammmals, human babies incl., often do with their hands. Not sure if there's a name for it, though I'm sure one of my LaLeche League friends would know. I've read of a link between some cats' habit of tapping their owner (sometimes called 'making biscuits') and their experience nursing as kittens. It's probably calming to both the nurser and the nursee in humans. I also thought of the drumming done by woodpeckers to assert territory and wondered if perhaps the ant was releasing pheromones or another territory-marking chemical with its antennae during this action. Absolutely amazing photographs and footage. I have seen both ants and the butterflies on gray dogwood, but never the larvae. 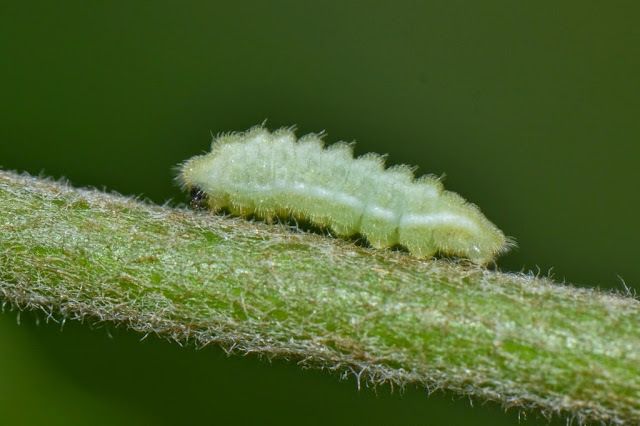 The larvae are well camouflaged and are rather small and hard to see. I watch for their ants... the ants can help give away the location of the caterpillars. I've observed the kind of ant behavior you describe here, and now I have an adjective to accompany it: myrmecophilous.